In 1968, Qantas scored something of a marketing coup when the airline featured in one of the famous Tintin comic books. 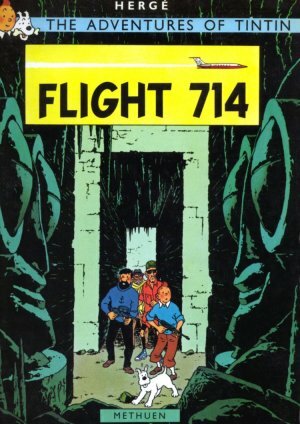 The book, which was titled Flight 714, begins with Tintin and his companions, including his dog Snowy, disembarking from Qantas Flight 714 at Djakarta having travelled from London. Clearly Snowy is not just any dog as he walks from the aeroplane with the other passengers, albeit on a lead! Flight 714 is operated by a 707 V-Jet and although it appears long enough to be a 338C, it has a ventral fin marked with an "A" and the aeroplane is named City of Melbourne, so clearly the real star of the show is Boeing 707-138B VH-EBA. 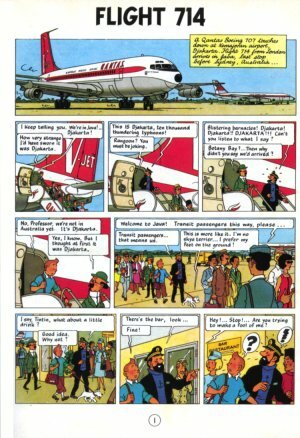 The ensuing adventure takes place in what is now Indonesia and concludes with Tintin and his companions again boarding Flight 714 for Sydney and again it is operated by VH-EBA. Although Qantas did at times operate a service from London to Sydney via Djakarta, the flight number appears to be fictitious. The following images are linked to larger versions.